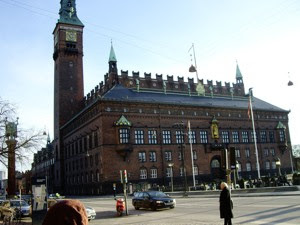 At the end of Strøget, you will find the impressive City Hall built in the period 1892-1905. The inspiration for the architect, Martin Nyrop, was the Palazzo Publico, in the city of Siena, Italy. This was a new location for the City Hall. The older had been situated on Gammeltorv / Nytorv since 1479. The previous building used for this purpose, built in 1815, can still be seen there. The city hall is a truly impressive building, with a bell tower of 105 metres. The facade is decorated with splendid guilded sculptures.